The black/large HS2 Lightweight Headset Microphone from RØDE is a low profile, ergonomic microphone that provides clean, clear and pronounced audio for applications such as public speaking, lectures, conferences, or anywhere a microphone needs to be in close proximity to any presenter's mouth. 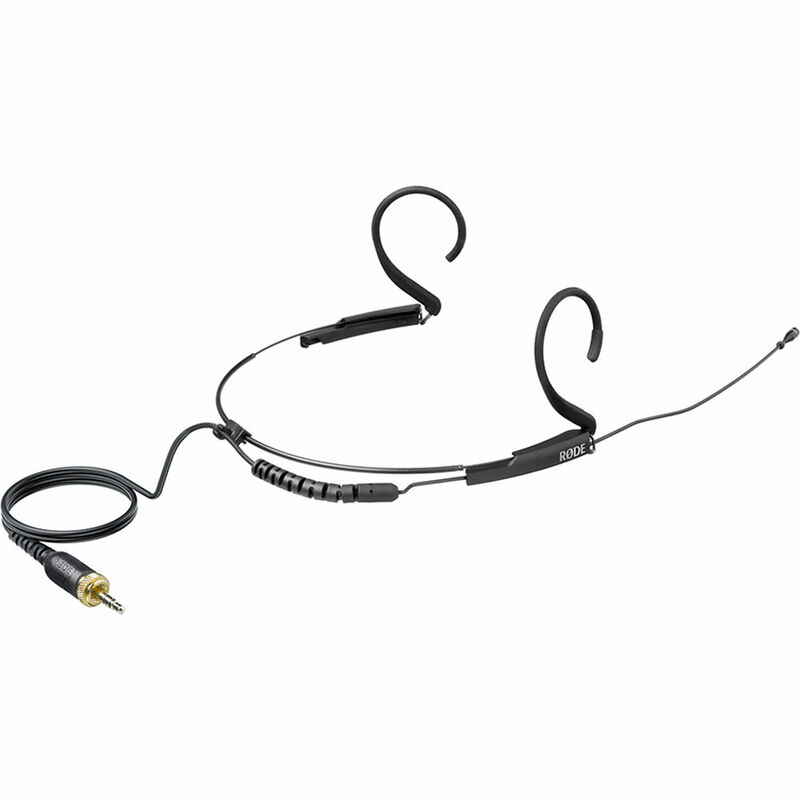 Featuring an adjustable, corrosion resistant stainless spring-steel boom arm and headband, the headset has hypoallergenic silicone ear strips for maximum flexibility and comfort. Coated in a durable ceramic painted finish in either black or pink, the HS2 is available in two different sizes (small or large) to ensure a perfect fit for any individual. Furthermore, it is connected via a 4' braided and shielded Kevlar reinforced cable, terminating with a gold-plated 1/8" TRS mini-jack output connector, which has a removable locking nut that ensures a secure connection to a wide range of recording devices and wireless transmitters. Finally, the HS2's lightweight, comfortable fit, low self-noise, minimal appearance, and user friendly omnidirectional polar pattern make it an ideal microphone for film, television, video, theatre, house of worship, and live vocal performance applications. Box Dimensions (LxWxH) 8.3 x 5.8 x 2.2"
HS2 Lightweight Headset Microphone Black/Large is rated 5.0 out of 5 by 1. Rated 5 out of 5 by Paul from Very Nice - Recommend LARGE Excellent - make sure you get the Large - unless you truly are a 7 year old!. I wish I could find a replacement HS2 windscreen, not 3rd party, but works well even without windscreen. Sound is perfect. Can the Rode Hs2 be used as the Rode Wireless Go?